- Effects system syncronisation by means of a Network Time Protocol (NTP). - Provides timestamping of messages. Despite the raw performance available at the lower layers of the LAN profile, networked systems can still suffer from transfer latency and jitter. Latency and jitter are problems as they may lead to instability in distributed control algorithms. However, the data repetition rates required by the collaborative distributed algorithms can be sufficient if accurate timing of the data samples can be recovered. Real-time systems therefore require services from the network which circumvent the problems of latency and jitter. Timestamping of data by the producer, using accurate network time derived from NTP, allows a consumer to reconstruct critical timing information by determining the age of the data. NTP implements timing mechanisms between all participating sub-systems over the network. The protocol does not rely on the accuracy of the clock of a single peer, but rather attempts to find the most accurate time source available to it. Each node maintains a local clock to provide time values and to synchronise with all other clocks on the network. 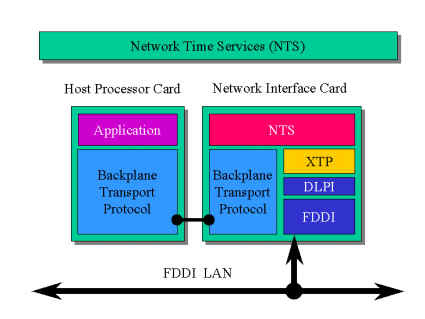 NTP provides basic functionality such as syncronisation and timestamping to NTS. NTS in turn provides user-level time services to the application. Network Time Services allow a user to obtain the current clock and an indication of the accuracy and quality of the value. NTS can provide synchronisation services, both with respect to calendar time (i.e. absolute time) as well as relative time between distributed clocks. For many distributed applications, only relative time synchronisation is required. For certain applications, e.g. synchronisation of remote encryption devices, calendar time synchronisation is required. Conditions : FDDI local area network in ring topology with 40 nodes and 2 500 m circumference.